My wife and I are Shakespeare enthusiasts in the extreme. So we were delighted to discover the St. Petersburg Shakespeare Festival. 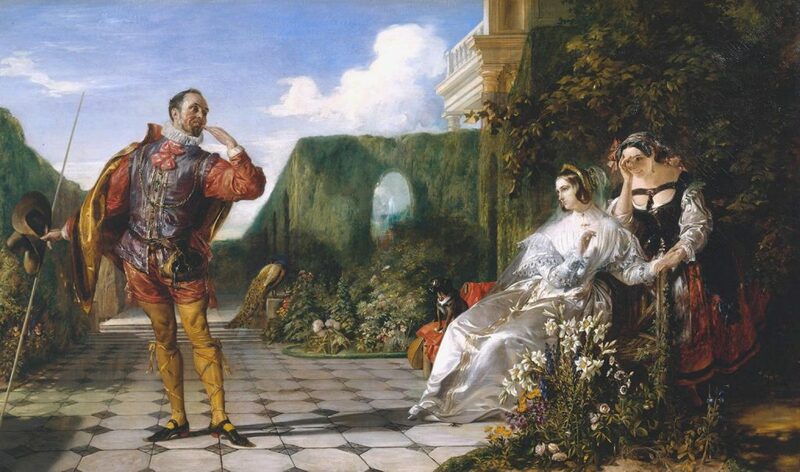 Last Friday evening, a couple of blocks from the waterfront, in a courtyard between two Victorian houses, under an enormous oak tree, we watched a wonderful performance of Twelfth Night, one of our favorite plays. We’ve seen it a number of times before, and talked about some of the puns and hidden meanings. 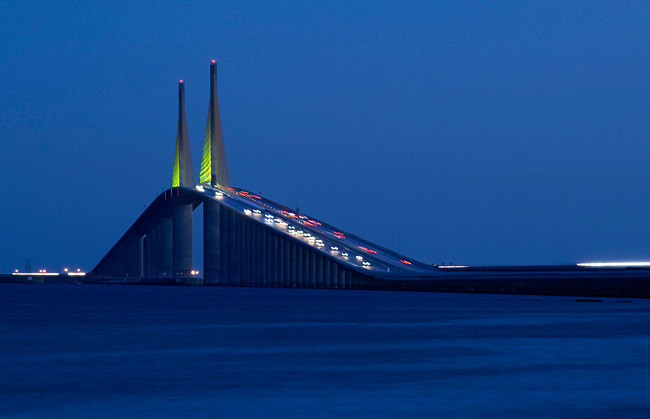 On the long drive home over the Sunshine Skyway, we had another of those conversations. One thing we find interesting is the similar names of several of the characters—Malvolio, Olivia, and Viola. All share the same letters. According to the website BehindtheName.com, the name Malvolio was invented by Shakespeare and means “ill will” in Italian. From the same site, we learn that “Olivia” was also first used in Twelfth Night, and is probably derived from the name of the olive tree. “Viola” meanwhile, is Latin for violet. So if we think of all characters as being projections of the author, and recall that Shakespeare went by the name “Will,” we have Malvolio, or the bad Will. We also have Olivia, the Will who is like the olive, because she is bitter and melancholy. And Viola, the Will who is bright and clever. Okay, those last two might be a bit of a stretch. But “revolve”? This is sometimes played on stage for comic effect by Malvolio twirling around. That’s good. According to the Annotated Twelfth Night the word revolve means “think things over.” Also good. …Which also fits the meaning of the text. How perfectly you crush the dreams you gave. Enslaved each other while longing to be free. Makes atoms dance and galaxies to spin. 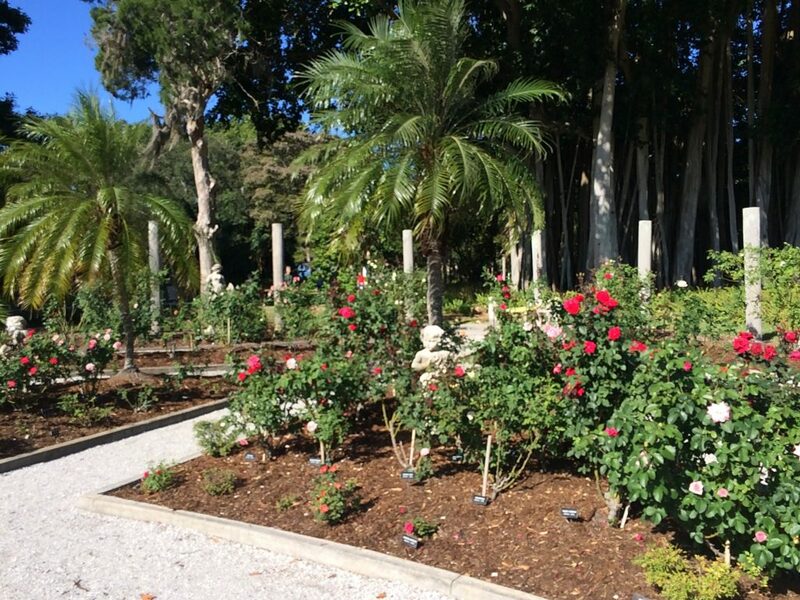 This week, my wife and I visited the Sunken Gardens in St. Petersburg. 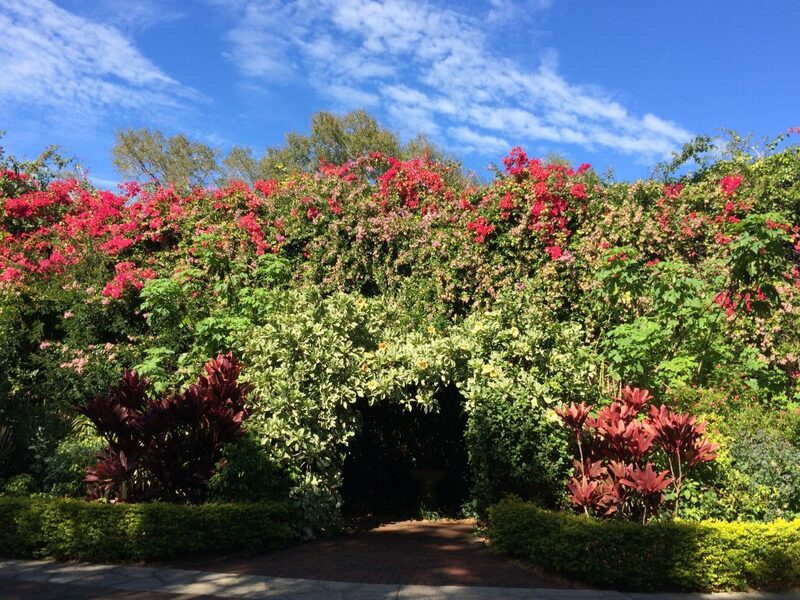 According to the brochure, the gardens date back to 1903, when George Turner, “a plumber and avid gardener,” purchased and drained a shallow lake, which had filled an ancient sinkhole. They’re called sunken, because the whole place is 10 to 15 feet below street-level. What a great use for a sinkhole, I must say. 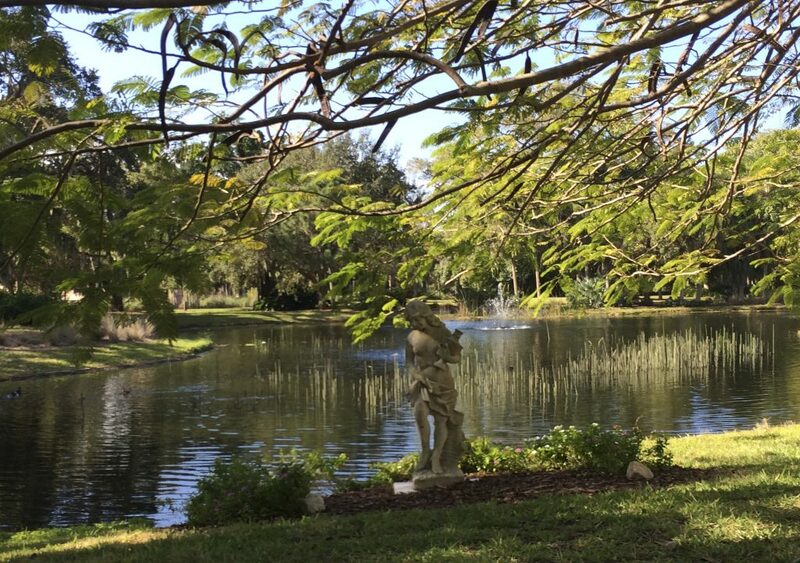 The gardens are full of streams, ponds, and waterfalls. 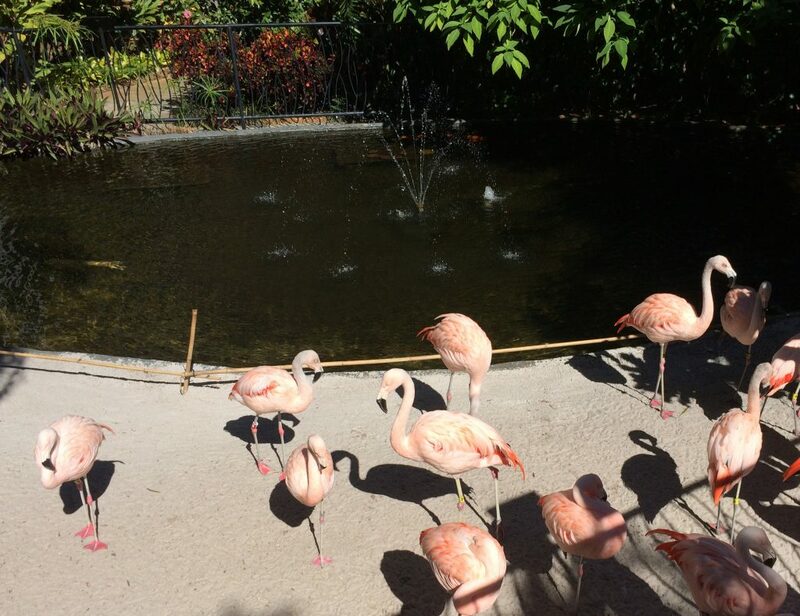 Along with the Flamingos you can see turtles, parrots, cockatoos and fish. 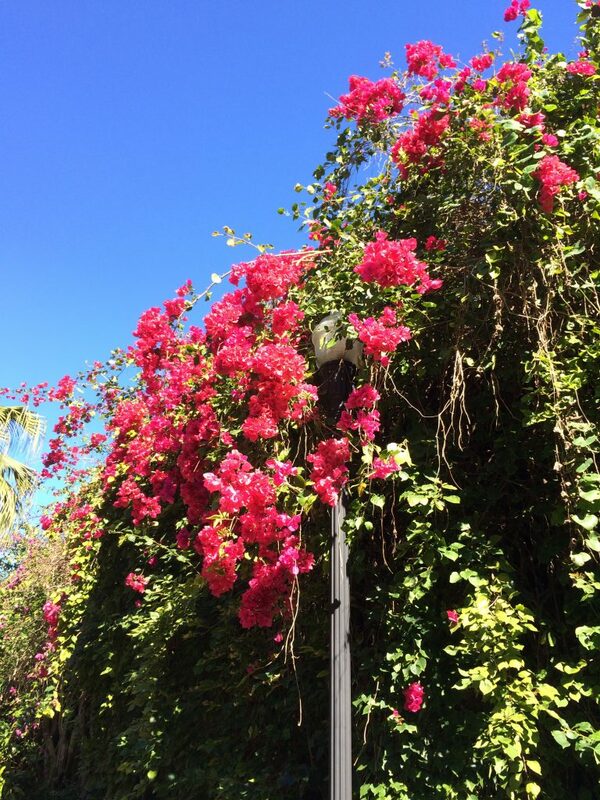 But the real attractions are the trees and tropical plants from all over the world. 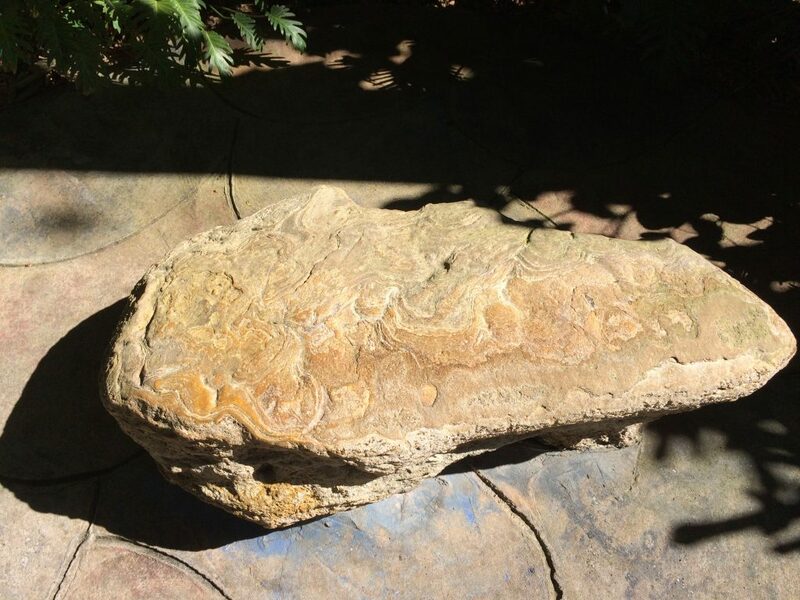 This limestone slab was found at the bottom when they drained the lake. The plaque claims that anyone who sits on the stone is gifted with tranquility, inner harmony, and the talent to make things grow. All new employees of Sunken Garden sit on the stone as part of their orientation. Now that is out-of-the-box talent development, folks. Naturally, my wife and I took the opportunity to sit on the stone. What happened later might just be a coincidence. After touring the gardens, we had lunch in downtown St. Petersburg. Walking back to our car, we passed a craft gallery. 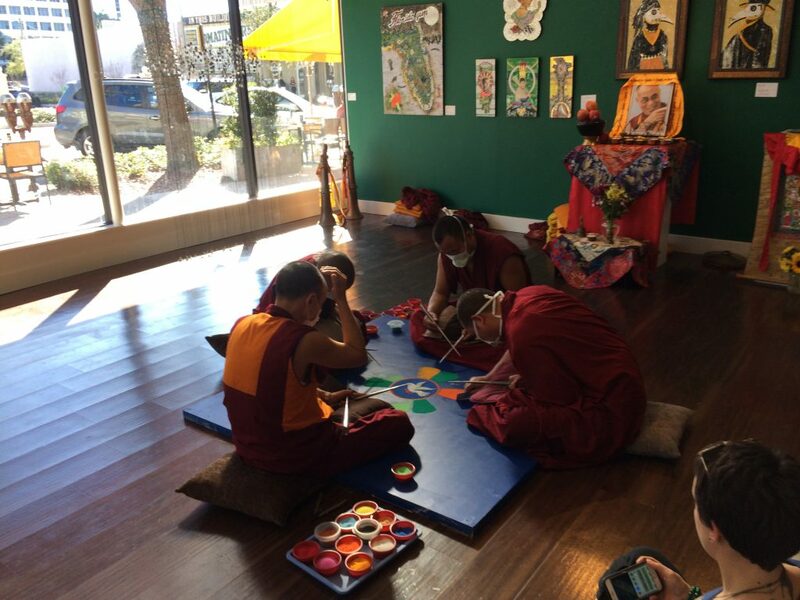 Inside, four Tibetan Monks were creating a sand painting. 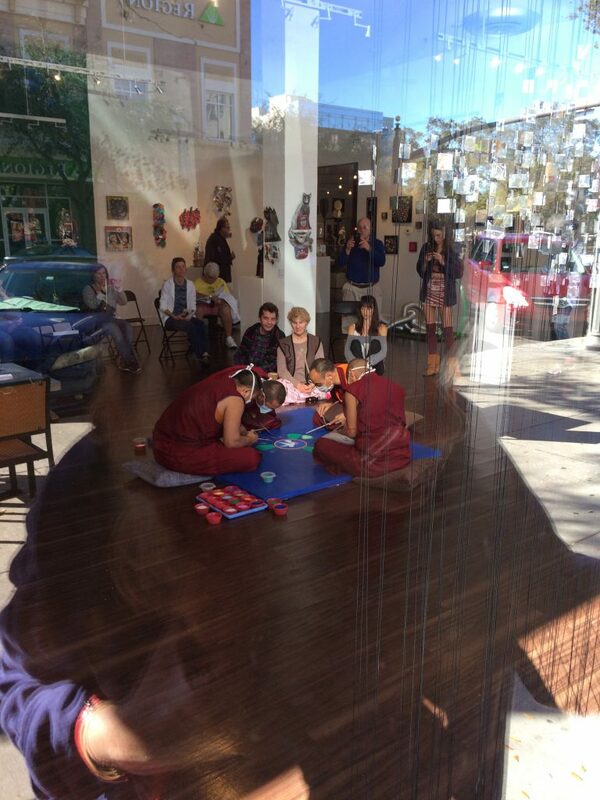 Tibetan Sand Painting (through the window). We went inside to get a better look. The painting featured a white dove at the center. The whole experience was one of deep tranquility and inner harmony. But like I said, it might just be a coincidence. 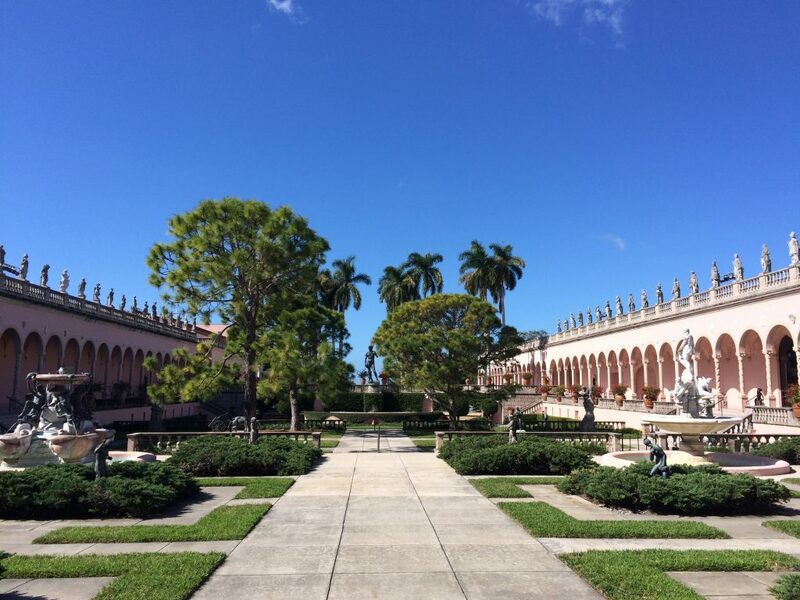 One of my favorite “Old Florida” spots is the Ringling Museum of Art complex in Sarasota. You can read about how this wonderful place came to be on their official website. 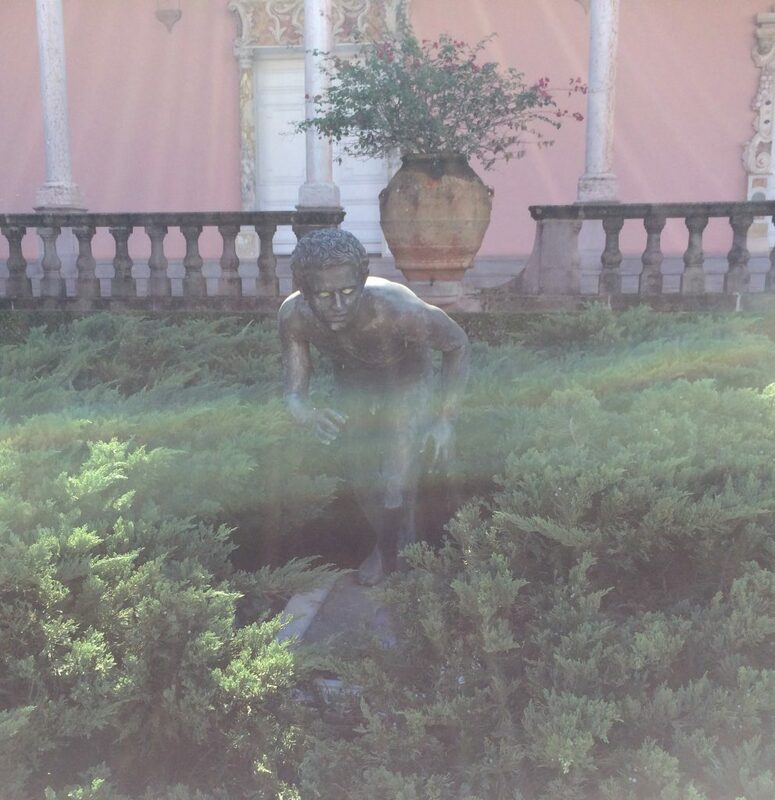 This pond and statue are near the gate house. A Rainbow Eucalyptus tree showing off its beautiful colored bark. 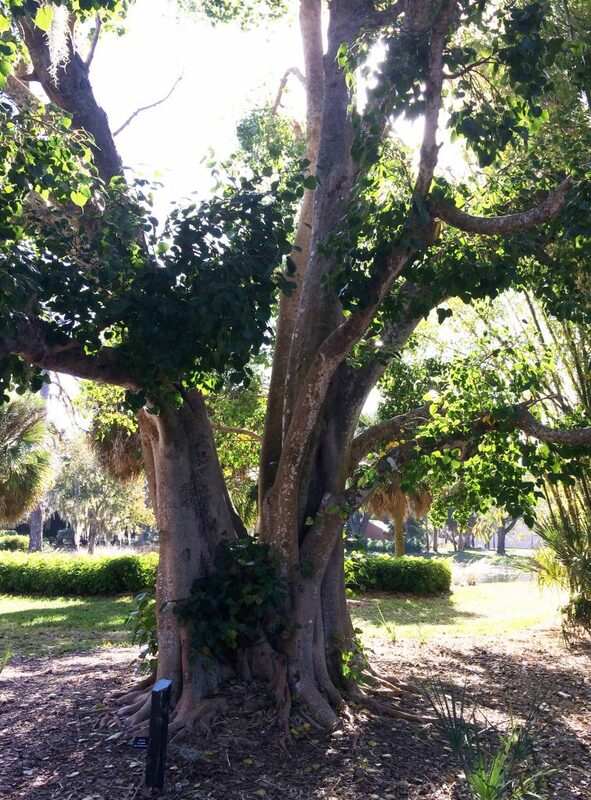 This Banyan grove overlooks Sarasota Bay. 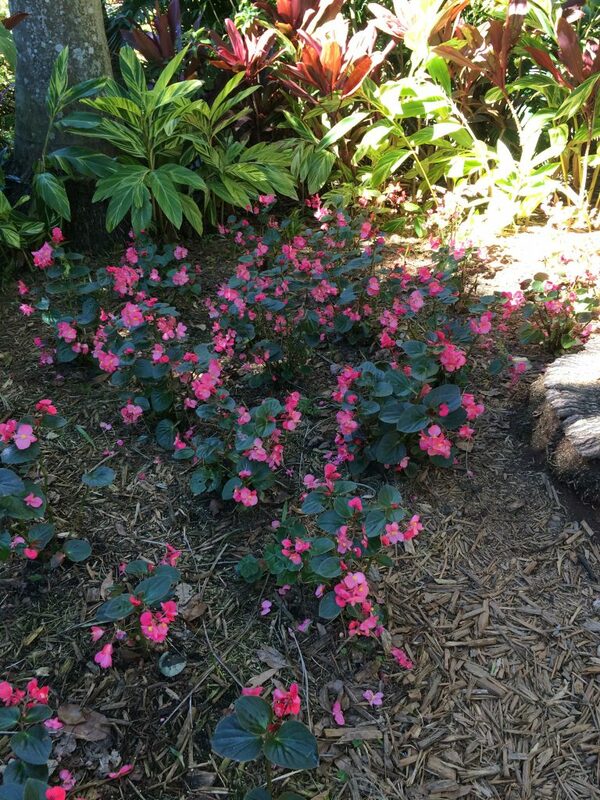 The Gardens are not without their dangers. 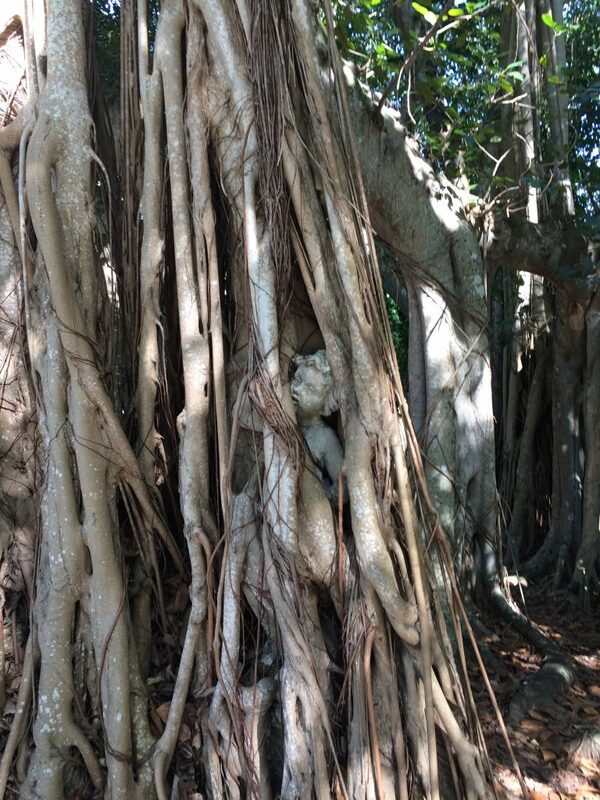 The Banyan trees, for example, have been known to eat the statues. 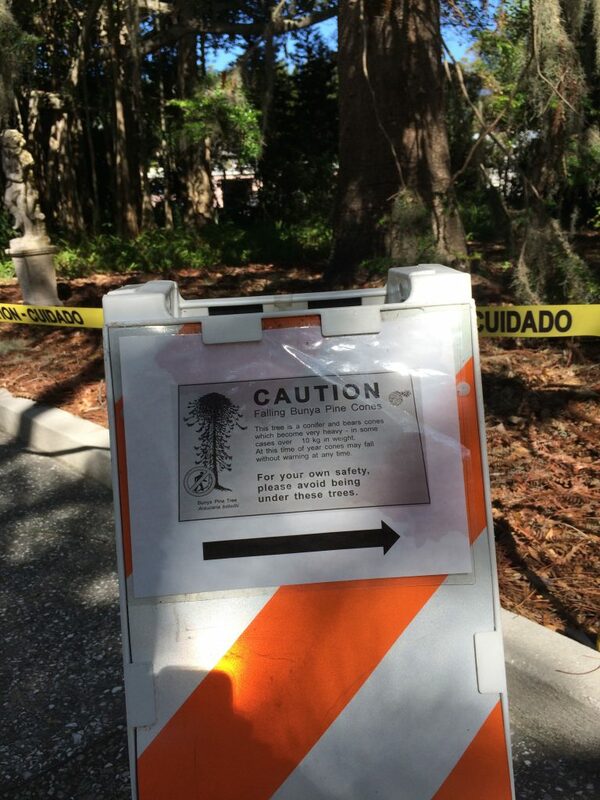 …and the Bunya Bunya trees can drop 20 pound “pine cones” on your head. 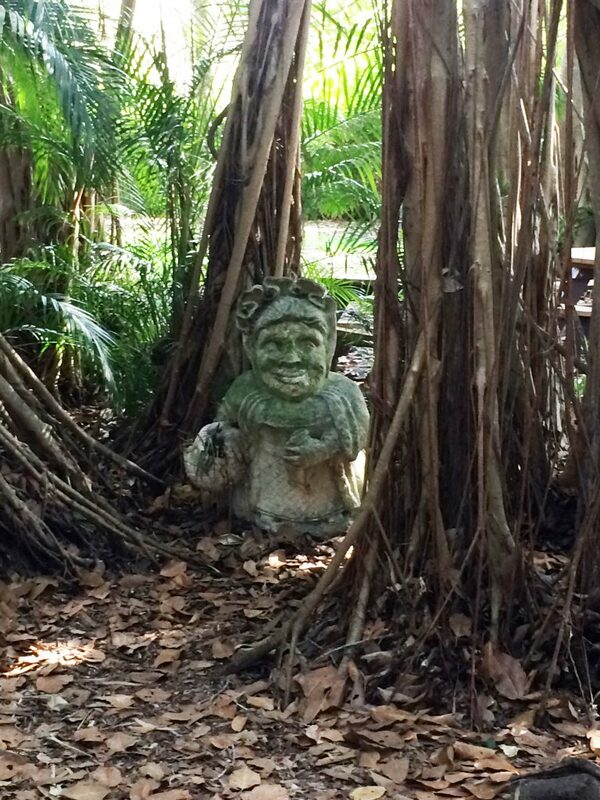 There are even naked zombie statues lurking in the foliage. But for the most part, the denizens of the garden are friendly. 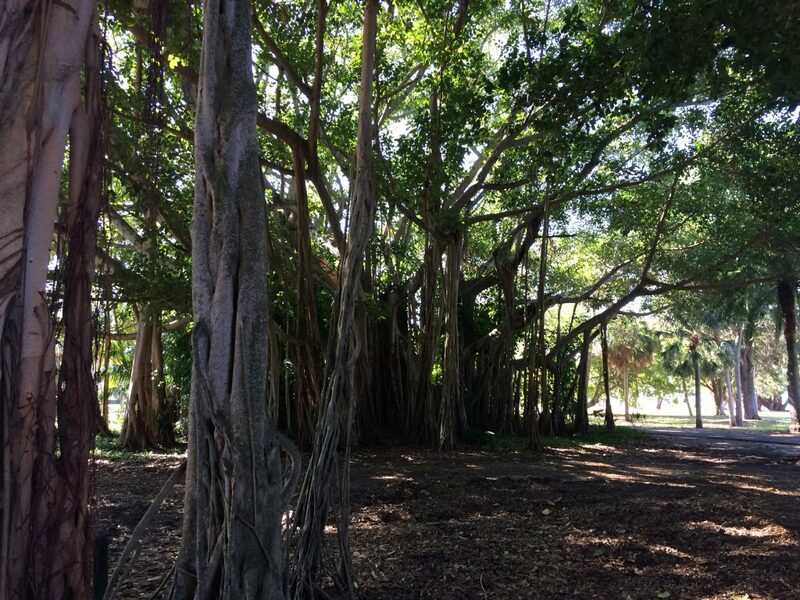 The Ringlings are buried at the edge of the property. Here, a butterfly is paying her respects. 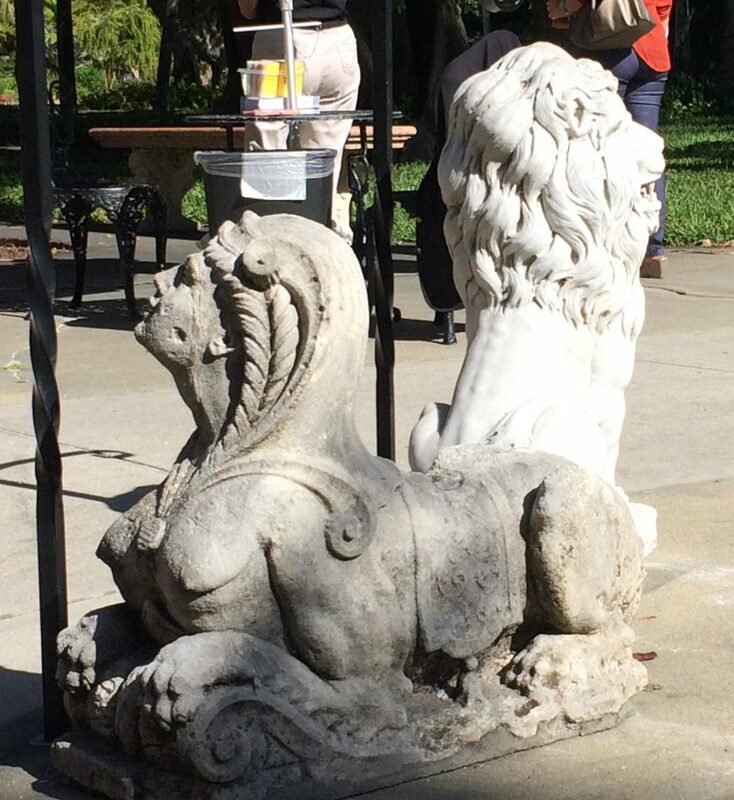 This lion and sphinx apparently had an argument. I think they are stuck with each other, so hopefully they will make it up. The courtyard of the art museum. The reproduction of Michelangelo’s David is used on the logo of Sarasota County. Now it is Yule Time. 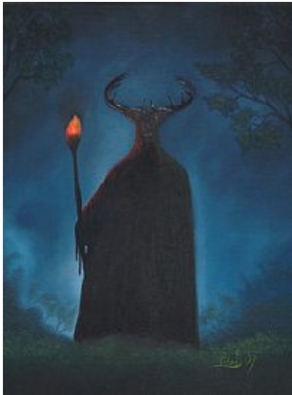 The Solstice is just past, the light starting to grow again, and Herne the Hunter is stirring in the depths of the forest. Herne is mentioned in Shakespeare’s Merry Wives of Windsor as a local ghost who haunts Windsor Wood. But Margaret Murray, in her 1931 book God of the Witches, posits that Herne is a manifestation of a much older being, Cernunnos, the Celtic horned god. (For more on this, see here). Herne/Cernunnos is the God of Nature, Lord of the Forest and of wild creatures. Because it is Nature that feeds us, he is the provider of food and therefore of life. I think of him as the embodiment of Desire with a capital D—the fire in the belly that drives us all to live. Happy Yule to you all, and good hunting! As one who commits fantasy fiction, I read a lot. Not only fantasy, but science fiction, mystery, classics, magical realism, thrillers, you name it. Not to mention lots of nonfiction for research. When I’m working on a story, I prefer to stay away from that particular genre in my reading. So I haven’t read too much fantasy in the last couple of years. That said, here are my reviews of three books I did read that I think are really great and deserve more attention. 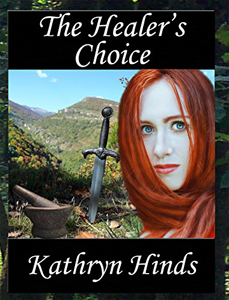 Epic fantasy: a first novel by an author with lots of expertise in history and medieval scholarship. 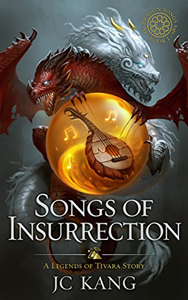 My review: The characters are varied and true-to-life, and every one is rooted in the imagined cultures in which they live. The world-building is complex and beautifully wrought, from the smallest details of daily living to the intricacies of war, medicine, philosophy, religion, and magic. The story is multi-faceted, with twists and surprises that are alternately exhilarating and heart-breaking. The author manages multiple viewpoint characters and story lines with a deft touch, keeping the reader intrigued. She even throws in some lovely poetry that feels authentic to the people and times she writes about. Magical! My review: Excellent epic fantasy set in a world inspired by pre-industrial Asia. Beautiful, detailed world-building, sympathetic and interesting characters, well-defined magic, and very skillful writing. To be honest, most indie-published fantasy novels I’ve read have not been up to what I’d consider professional standards. This one is certainly an exception. 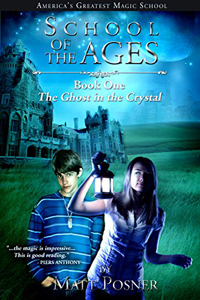 A YA urban fantasy and the first of a series. a varied set of adults, magical and non-magical, with interesting perspectives and sometimes murky motives. a many-layered plot that keeps cooking with twists and surprises. Yikes! If, like me, you favor serious magic in your fiction, it doesn’t get any better that this. of grief. I come in to the presence of still water. Beautiful poem, but the line that struck me was about how wild things do not “tax their lives with forethought.” Only humans do that. 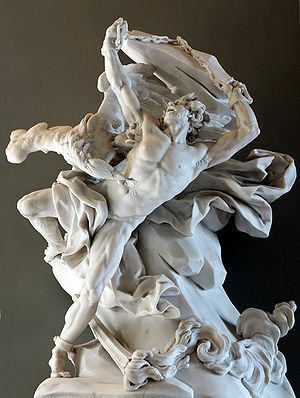 Then I remembered the myth of Prometheus, and that his name means “forethought.” In the myth, of course, the Titan Prometheus steals fire from the gods and gives it to humans. As punishment, Prometheus is chained forever to a rock and each day an eagle comes and eats out his liver. But the fact that his name means Forethought made me wonder. What if the “fire” that Prometheus really stole from the gods and gave to us is exactly what his name says? Forethought—the capacity to think ahead and imagine what may be next. That’s what sets us apart from the wild creatures and makes us like the gods. And it’s what causes us to wake up in fear of ‘what our lives and our children’s lives may be.’ Or, you might say, causes that eagle to keep coming back and eating out our livers (or our hearts). These days many of us are living in fear of the future: political insanity, climate change, disasters around every corner. Many are eating their hearts out. That’s forethought, I’m afraid. Part of what makes us human. And maybe, like Berry’s narrator, seek out the presence of the still waters. And remember that, though you can’t see them at the moment, the stars are waiting with their light. In Ghosts of Bliss Bayou, Abigail Renshaw is a young woman studying magic—a kind of magic formulated by her ancestor and his contemporaries, who founded the town of Harmony Springs in Florida. Midway through the story, Abby’s grandmother gives her a ring that has been passed down through the family. She places the ring in my hand, and I feel its energy, like a tiny electric current. The gold is formed into leaves and vines framing a cameo: the white-on-black image of a woman with wild hair, holding a torch. 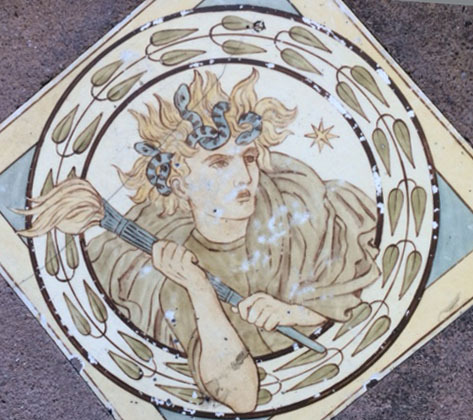 Goddess Image, possibly Hekate, from antique tile. The idea for the fictional Circle of Harmony came from the so-called “occult revival” of the late 19th Century, a period when spiritualism and magic became fashionable in Europe and America. During this time, the Hermetic Order of the Golden Dawn flourished. The Golden Dawn espoused a system of magic that drew on many occult sources, including Kabbalah, Tarot, and Rosicrucianism. Another source of the Golden Dawn system was Neoplatonism, a philosophical tradition of late antiquity. A key document of Neoplatonism is the Chaldean Oracles which survive today only in fragments. The cosmology of Neoplatonism envisions a divine creative fire, which is the source of the manifest universe. Seated at the portal between this uncreated fire and the world we know is a Goddess Figure. 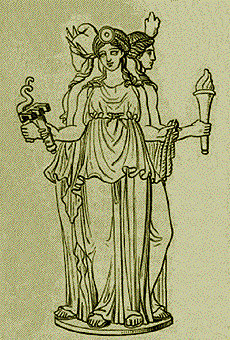 In the Chaldean Oracles, she is named Hekate, after the goddess of the ancient Greeks. A good scholarly summary of this topic can be found in this paper by John D. Turner of the University of Nebraska-Lincoln. 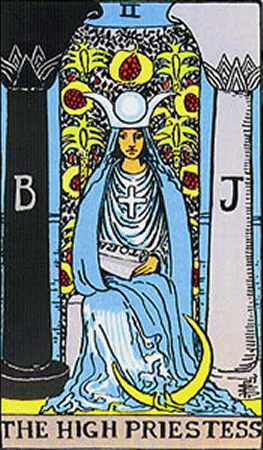 This idea of a Great Goddess who sits at the threshold between the creative source and the manifest world, is also pictured in the Tarot. from the Waite-Rider tarot deck created by Pamela Colman Smith. Early in Ghosts of Bliss Bayou, Abby comes across this card in a reading. But my eyes are drawn to the crown position—the High Priestess. I’ve read that she’s actually a goddess, seated on her throne at the place of balance between the positive and negative polarities of the Universe. I stare at her serene face and her robes. In the picture, the robes turn into a waterfall and then a blue stream that flows away. It flows down through all the other cards that have pictures of water—the Stream of Life that gives birth to everything. 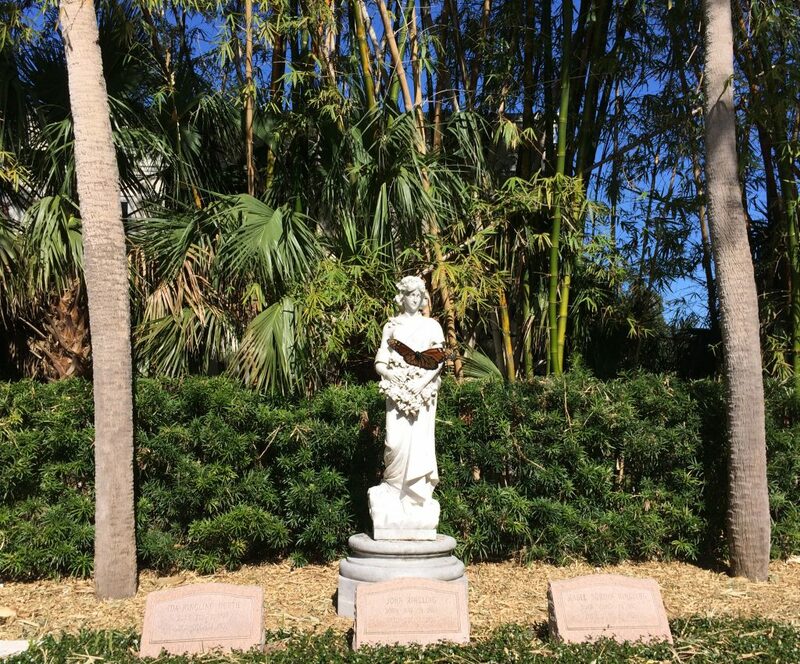 In Ghosts of Bliss Bayou, Harmony Springs is a small town in Florida with an occult history dating back to the late 1800s. 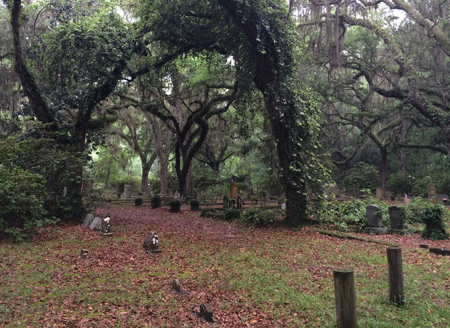 This idea was based on several places in Florida, which were actually founded as spiritual or Utopian communities— including Ruskin, Estero, and Cassadaga. 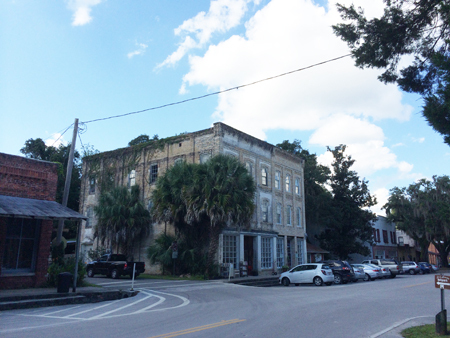 But the inspiration for how downtown Harmony Springs looks came from visiting another old Florida town, Micanopy. 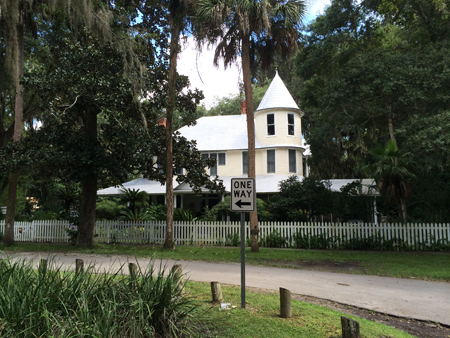 This post has some pictures taken in Micanopy, to give you the flavor. Early in the book, Abby describes looking at the town on Google Earth. 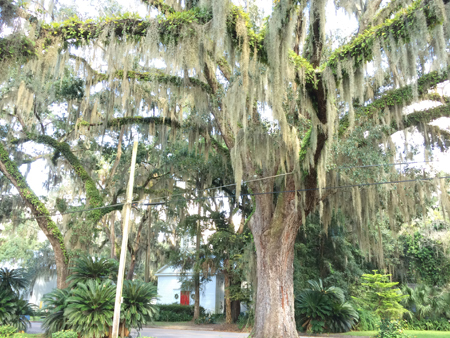 …The historic downtown looks exactly the same, and it’s amazing—a few blocks of old shops and commercial buildings, the streets lined with huge, twisted oak trees draped in moss. 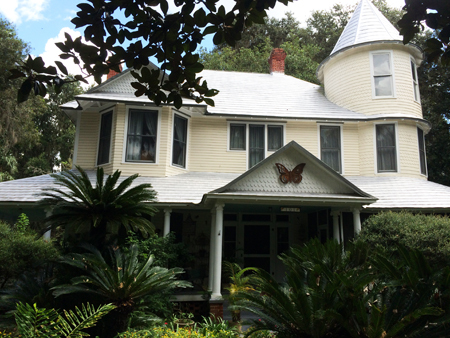 And Victorian houses with wraparound porches and pointed turrets. The street-level pictures make me all warm and nostalgic. I feel this ridiculous yearning to be there. 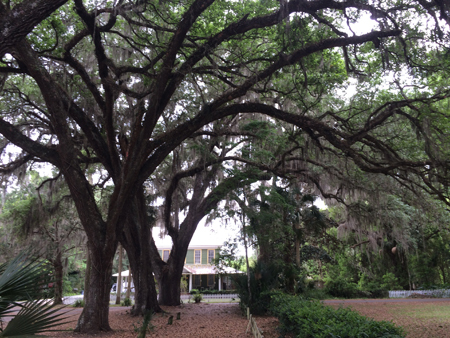 In a later chapter, Abby is walking downtown on her first morning in Harmony Springs. 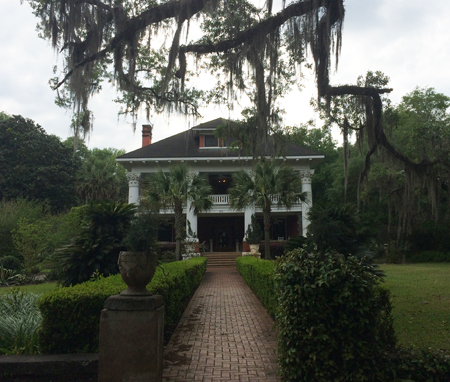 This, by the way, is the Herlong Mansion in Micanopy, now a bed and breakfast. Some sources claim it is haunted. 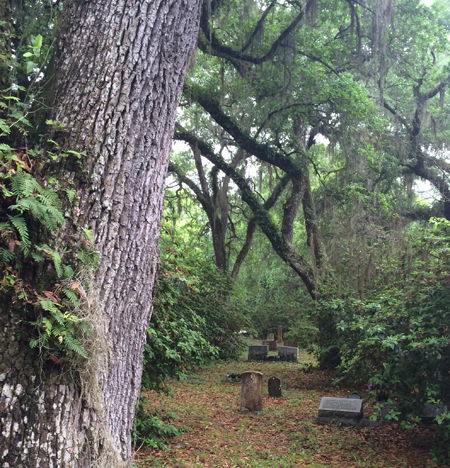 Late in the story, Abby and her friend Molly sneak into the town’s historic cemetery at midnight. We cruise down a winding path of hard-packed sand and crushed dead leaves, past gravestones and monuments, some well-tended, some overgrown. Black branches reach over us like twisted fingers. Maybe it’s my imagination, but I can sense all the spirits sleeping around us. In a series of novels I wrote a few years ago (publication forthcoming) there is a scene that touches on choosing your beliefs. 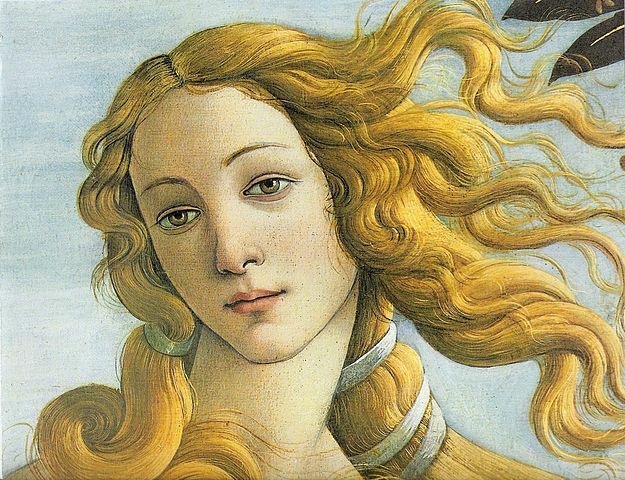 The story takes place in the ancient Greek world, and was inspired in part by my love of Greek mythology. 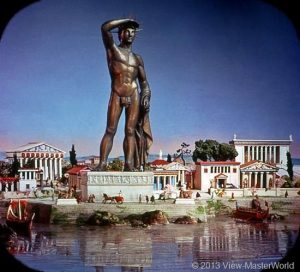 The hero is a citizen of the island of Rhodes, home of the famous Colossus, one of the wonders of the ancient world. Artist’s Rendering of the Colossus. In this scene, a town on Rhodes has been sacked by pirates. The hero, Korax, has volunteered to join a naval mission to put down the pirates and try to rescue the townspeople. The prospects for the mission are dicey, to the say the least. Korax is talking to Nicoles, the admiral who leads the fleet. To Nicoles, the gods are a living presence in his world. If the politics of 2016 have shown me anything, it is that we all choose what we want to believe. I choose to believe that our lives have a higher purpose we cannot fully grasp and that, despite all of the evil in the world, our species is evolving and becoming better. I choose to believe this because believing anything else leads me to despair. ...for our mailing list and get free, cool stuff.